While you have valid rescue media, it is possible that further down the line you add hardware to your computer without updating the rescue media. Macrium Reflect provides a way of loading drivers for these pieces of hardware when in Windows PE. Select a device from the list and click the Locate Driver. Browse and select a driver INF file in the dialog that is displayed. Macrium Reflect will try and load the driver and report the result back. Select a base folder using the ellipsis button and then click Scan. Macrium Reflect will traverse the folder structure looking for driver INF files for all devices in the list. After the scan, a dialog will be displayed showing which devices had drivers loaded. After downloading a driver package, unzip to a folder that Macrium Reflect has access to. All files within the driver package should be extracted including .CAT and .DLL files. 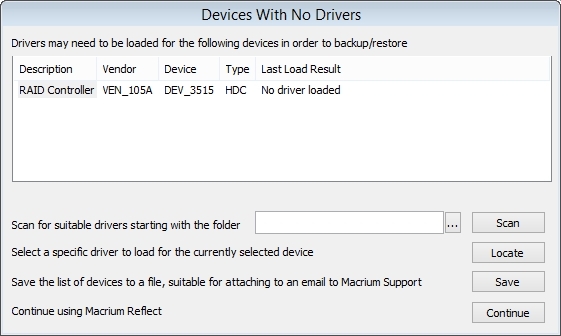 When loading drivers Macrium Reflect will check for device support in INF files and if found will attempt to load the driver. It is important that all the files that the driver package consist of should be present in the same folder as the INF file. There will definitely need to be the .SYS file for the driver. The driver package may also consist of .CAT and .DLL files, these need to be present in the same folder as well in order to load successfully. Drivers must ideally match the architecture of your Windows PE installation. It should be noted that Windows 7 drivers may appear to have been added to Windows PE 4.0/5.0 successfully but will only sometimes work.